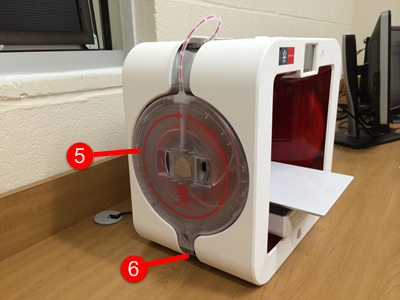 The Cubify Ekocycle 3D is a 3D printer located in Nicarry's Innovation Lab. 6. USB PortThe Ekocycle is equipped with dual-extrusion ink jets, and is capable of printing four different colors: Red, White, Black, or Gray. Attached to the sides of the printer are the ink cartridges, which contain the print material. The Ekocycle prints with 25% post-consumer recycled material. It offers 200 micron layer resolution. How does 3D printing work? The Ekocycle starts off by reading a design uploaded onto the printer via a flash drive, and creates an algorithm that details the most efficient method of producing the print. The ink jets will heat themselves to a temperature that's high enough to melt the plastic, and then extrude the molten plastic onto the print platform. When the plastic is heated, it's malleable and can be molded into different shapes. Once the plastic cools, it hardens into its intended shape. 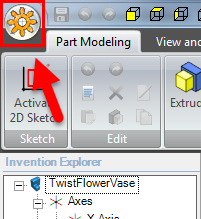 Two CAD programs are installed on the Innovation Lab computers to make your own 3D print design. They are Cubify Invent, and Cubify Sculpt. 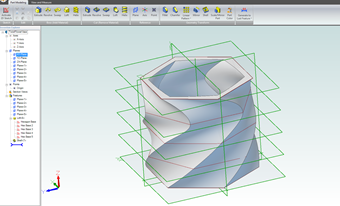 Cubify Invent is basic CAD software that is designed to be user-friendly and easy to learn. 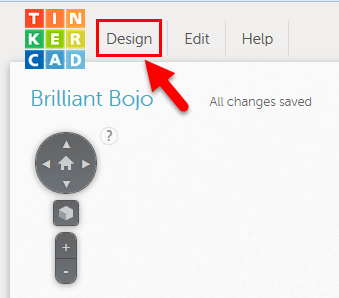 It's a great place to start if you're interested in bettering your design skills without needing to be a CAD expert. In Cubify Invent, you will typically start with a 2D sketch consisting of straight and curved lines, and then manipulate that initial sketch using several different types of techniques in which you add or remove material in order to produce a 3D figure. The program is planar based, meaning that with everything you sketch, you will use a base plane or line as a point of reference. 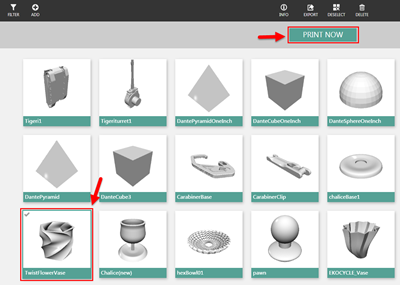 Cubify Sculpt is another program developed by 3DSystems to create your own 3D print designs. 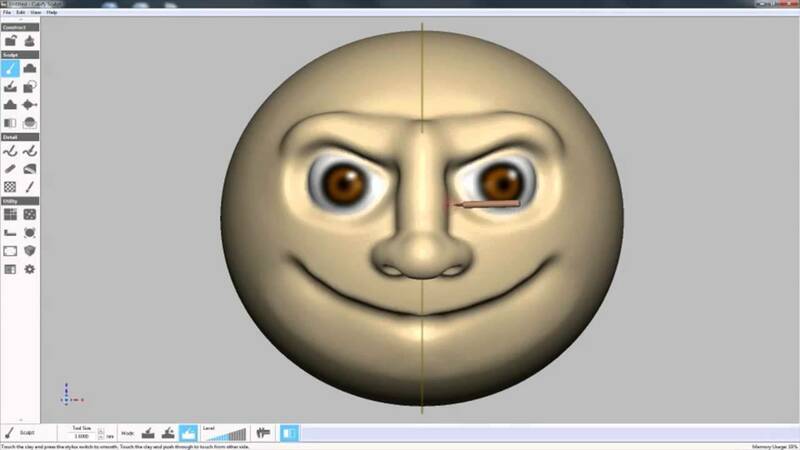 With Cubify Sculpt, you are essentially molding virtual clay to create designs. You can start with a base design and modify it, or start with just a ball or cube of clay and create something entirely from scratch. Here is an example of a design made on Cubify Sculpt. 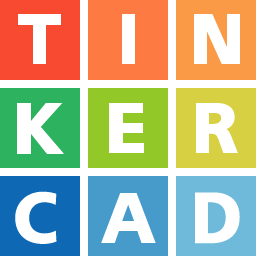 Tinkercad is a free web-based application that introduces the basic fundamental concepts of CAD. It's a bit elementary, but nonetheless informative and user-friendly. All you have to do is sign up for a free account, and then start building. 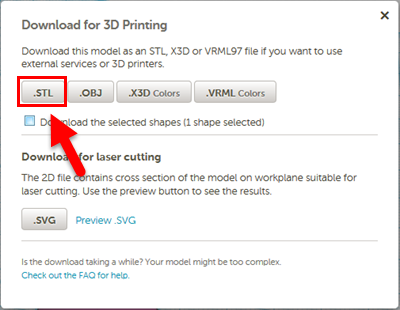 The standard 3D print design file format is an .stl file, which stands for "stereolithography". 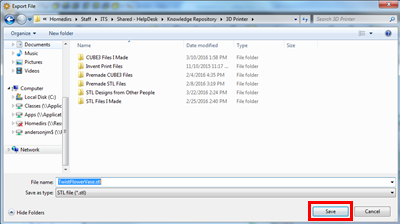 The Ekocycle 3D Printer cannot read this particular file type, so every time you created a design in CAD or download an .stl file from the Internet, you must convert it into a file format that is readable by the printer. 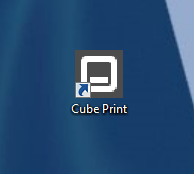 Below are instructions for preparing a file to print. 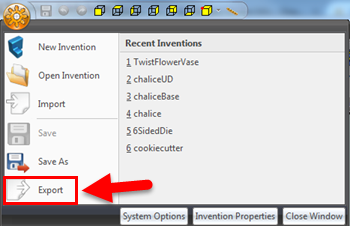 Step 1:Open the File menu by pressing the Invent icon in Cubify Invent, or File in Cubify Sculpt. Step 2:Click Export. This will save the design as an .stl file. 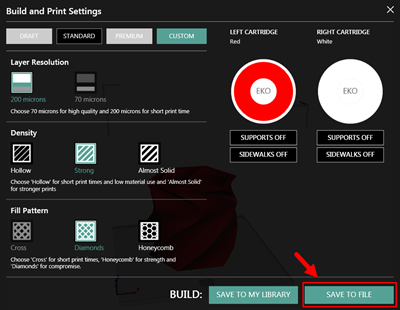 Step 3:Choose where you would like to save the file and click Save. 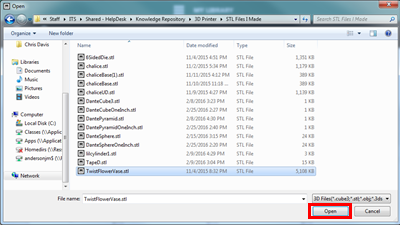 Step 6:Find your .stl file and click Open. 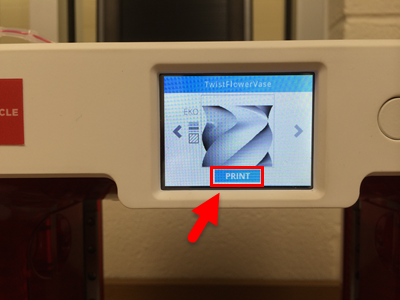 Step 7:Click on your design and press Print Now. Step 8:View your design in the preparation screen. If all looks good, press Build. Note: It's important that the colors on each side of the screen match the colors of the cartridges installed in the printer. If the colors are not assigned correctly, your print might not come out in the color that you want. 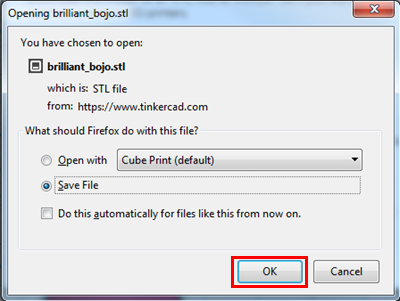 Step 9:Decide on how you want the print to be structured and press Save to File. 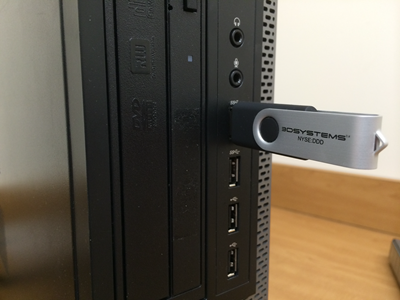 Step 10:Save the file to a flash drive. Step 11:Insert the flash drive into the printer. 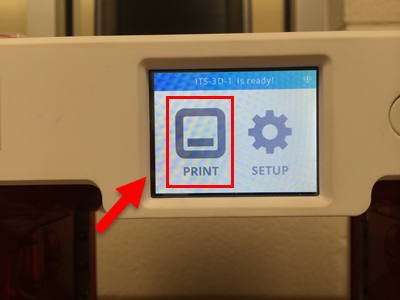 Step 12:Press PRINT on the 3D printer touch screen. Step 13:Choose your design and press PRINT. Your design will begin printing. 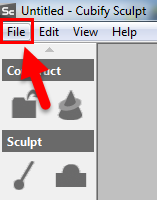 Step 1:Click Design in the upper left-hand corner of the screen. 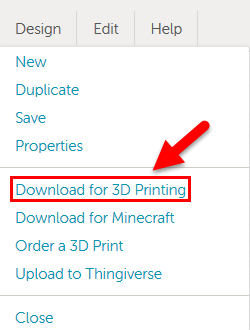 Step 2:Click Download for 3D Printing. 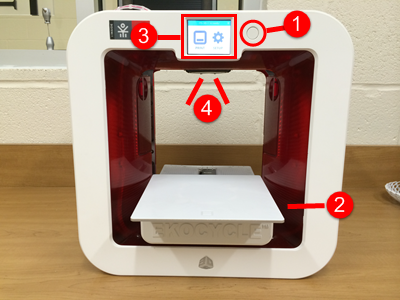 Step 5:Proceed to Step 4 under "How to Print Your Design" above. 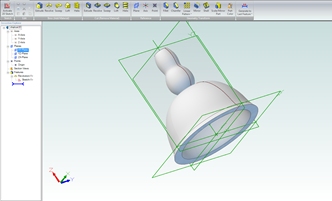 If you have an idea for a design but don't want to design it yourself, try searching online for a free, downloadable .stl file. 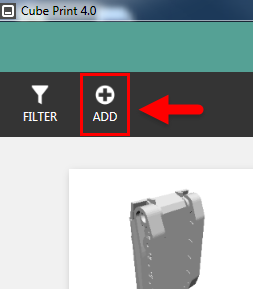 A great resource to use for finding free .stl downloads is www.thingiverse.com. 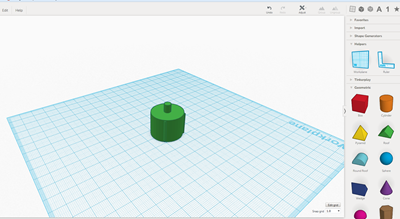 Thingiverse is an online community managed by the creators of MakerBot (another 3D printing company) that allows users to share their 3D print designs.